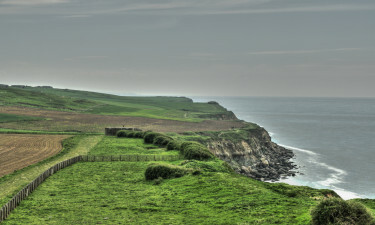 Camping Picardy - seaside campsites - search here! The proximity of the port of Calais and the Channel Tunnel makes Picardy ideal a quick camping getaway, but it’s the beauty of Picardy will keep you returning. For your next family camping holiday site, try scenic Picardy. The LUX-camp site locations in Picardy provide you and your family with the opportunity to walk back through history and witness the ancient battles of Europe. Given its position in the middle of the empire-building giants, Amsterdam, London and Paris, Picardy has been the site of significant battles throughout the centuries, including the Battle of Crécy, the Battle of Somme, and many WW 1 and 11 battle sites along the Somme River, and has been dominated variously by the English, French, Spanish, and the Hapsberg Empire. The most popular campsites in Picardy are La Bien Assise and Domaine de Drancourt. Overlooking the surrounding countryside, La Bien Assise is the holiday camping site that campers return to season after season. Chief among the attractions for the whole family is bird watching along the expansive Somme River estuary marshes. You can be assured that all the amenities of luxury camping will be yours in a LUX-camp mobile home or bungalow tent. Set in the gardens of the château and 2 km from the medieval city of Saint-Valery-sur-Somme, LUX-camp’s Domaine de Drancourt site provides camping luxury and multiple ways to experience the authentic French countryside. The pleasant vistas are enhanced by the sea air that imbues the sunlight with a quality that was sought after by post-impressionist painters. Despite the spectacular beaches on the Bay of Somme, Picardy is perhaps the least known of the French luxury camping site areas. 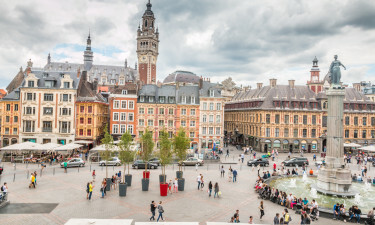 Picardy is bordered by the outskirts of Paris in the south, Belgium and the Champagne vineyards to the east, Pas de Calais and the sandy beaches of the Somme Estuary in the west, and Normandy in the southwest. 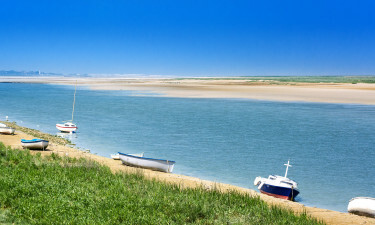 Luxury camping sites in Picardy are on the Bay of Somme, which offers long beaches, vast wetlands, sand dunes, and views from high chalk bluffs. 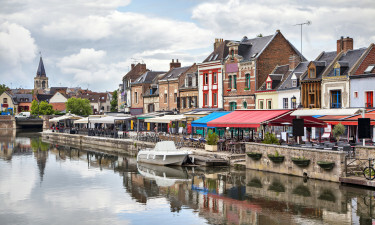 The largest cities of Picardy are Amiens with a population of about 133,000, followed by Saint-Quentin and Beauvais, both at around 55,000, and Compiègne at about 40,000. Amiens, the capital, dates back to the pre-Roman era and now is an industrial and railroad centre. The old quarter of Amiens is dominated by the cathedral, which is unusual in being one of the purist examples of High Gothic architecture in France. 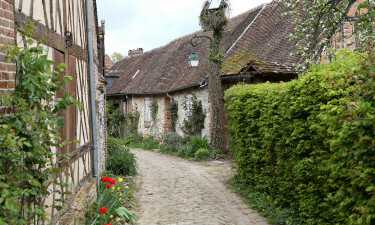 Other cities with notable historic architecture are Beauvais, Chantilly, Compiègne, Laon, St, Quentin, and rural villages in the Thiérache area. Gothic architecture was born in Picardy and contains preserved examples throughout the region that mark the entire development of the period in architectural history. The vernacular architecture of distinctive red brick with white “lace” bricks along the corners can be seen in the numerous châteaux. Picardy has two major theme parks for children, the famous Asterix theme park near Chantilly, and Mer de Sable, the Wild West theme park in Ermenonville. For WW 1 history buffs, the Caverne du Dragon is near Laon and features an underground network of passages used by both sides of the war. Also, Albert, Thiepval, has battle sites and monuments from the Great War.